← What should Vigneault do with the bottom two lines? The Rangers and the Stars will face off for the first time this season, pitting the two leading goal scorers, Tyler Seguin and RIck Nash, against each other. Photo courtesy of the New York Rangers. The Rangers (19-10-4) are currently in the midst of their longest win streak in 40 years. One win would tie the longest win streak in franchise history, but they will have to go through the Dallas Stars (15-14-5), who have won five of their last six games. The Stars are coming off of a 4-3 win against the St. Louis Blues, continuing their success in recent games. The Stars are still eight points back in the standings, but are hoping to climb into a wild card spot. Tyler Seguin leads the Dallas Stars offense, which can be very deadly at times. Seguin is having a potential Hart Trophy MVP season, with a league leading 25 goals and a total of 43 points (25-18-43) in just 34 games. Jamie Benn and Jason Spezza finish off the Stars top line, which is one of the best in the NHL. Benn has 30 points (10-20-30) and Spezza is just behind him with 25 (6-19-25). However, The Stars have struggled to stop their opponents from finding the back of the net. Dallas has allowed the third most goals in the league, with 116 goals against, and have a -17 goal differential. Kari Lehtonen is also struggling after having a solid 2013 campaign. Lehtonen’s record is decent, standing at 14-8-5, but he has a goals allowed average of 2.99 and a save percentage of just .904. Dallas has also not fared to well at home, posting a 6-7-5 record at the American Airlines Center. With all of that in mind, the Rangers will be looking to continue their winning ways against a vulnerable Stars team. The Blueshirts have won their last four road games, and have outscored their opponents 26 to 11 over the eight game win streak. Rick Nash had his first hat trick as a Ranger against the Capitals, and Derek Stepan followed that up with a hat trick against the Devils. 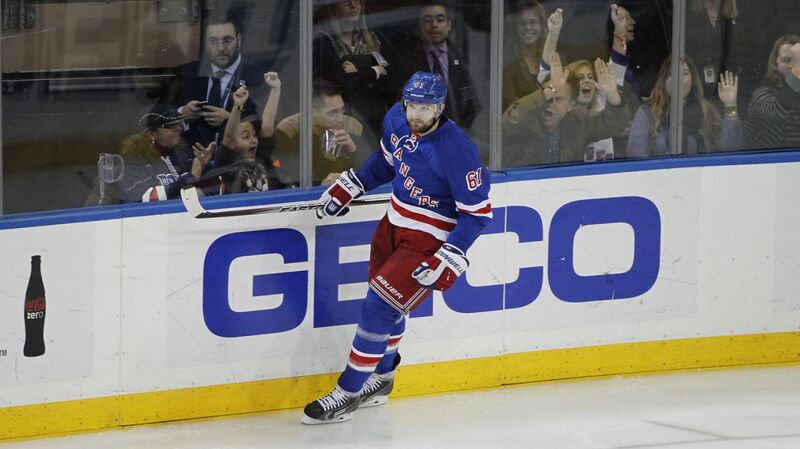 Other players like Martin St. Louis, Mats Zuccarello, and Derek Brassard have also been contributing. Derek Stepan was the MVP of the Rangers last game, picking up his third career hat trick in the win over the New Jersey Devils. Photo courtesy of MSG Photos. The Rangers have also been solid on defense and in goaltending. Rangers defensemen have been producing points lately, as well as limiting the opponents offensive chances. Rangers defenders have 11 points (6-5-11) over the last eight games. Lundqvist has won his last seven starts, and only allowed more than two goals just once during the win streak. Talbot started the other game and shut out the Hurricanes. The Rangers power play has also been rejuvenated as of late, scoring on five of their last 18 chances over the last five games. After sitting the last game, JT Miller was working on the Rangers second power play unit during the morning skate, signs that he will start tonight. 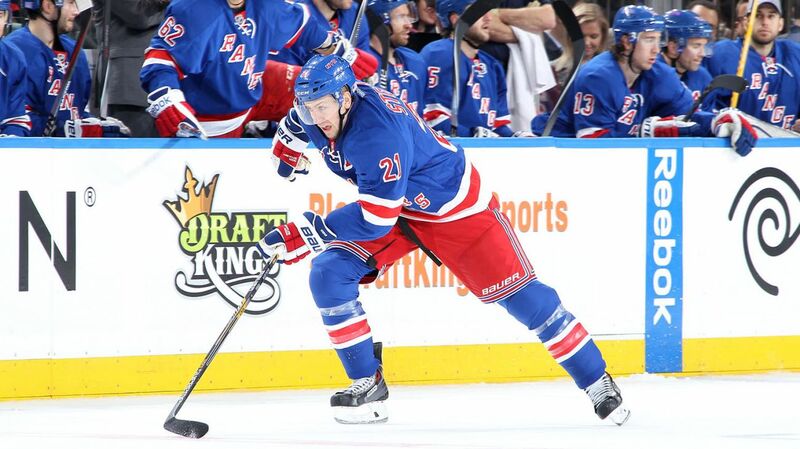 According to some reports, Jesper Fast could be the healthy scratch for the Rangers tonight. It will certainly interesting to see Tyler Seguin and Rick Nash match up, two of the best offensive players in the league. Nash has 23 goals this season and is red hot lately. He will certainly have some prime offensive chances against an exploitable Stars defense and goaltenders. Rick Nash is one of the players to watch, as he will go up against a vulnerable Stars defense and a struggling goaltender in Lehtonen. Photo courtesy of MSG Photos. 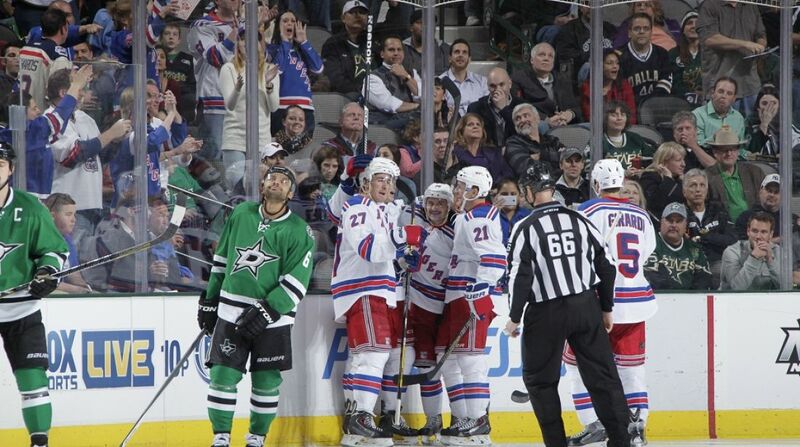 The Rangers and the Stars will face off at 8:30 PM in Dallas, and the game will be aired on MSG Network. Posted on December 29, 2014, in Game Previews and tagged Alain Vigneault, Alexander Ovechkin, Anthony Duclair, Cam Talbot, Carl Hagelin, Chris Kreider, Dallas Stars, Dan Boyle, Dan Girardi, Derek Stepan, Derick Brassard, Dominic Moore, Henrik Lundqvist, Jaromir Jagr, Jesper Fast, John Moore, JT Miller, Kevin Hayes, Kevin Klein, King Henrik, Lee Stempniak, Madison Square Garden, Marc Staal, Martin St. Louis, Mats Zuccarello, Matt Hunwick, MSG, New Jersey Devils, New York Rangers, NHL, NHL 2014-2015 Season, NY Rangers, NYR, Ovechkin, Rangers Nation, Rangerstown, Rick Nash, Ryan McDonagh, The Duke, The Ranger Zone, Tyler Seguin, Washington Capitals. Bookmark the permalink. Leave a comment.